Food and drinks, excluding bottled water, are NOT permitted in the auditorium. Smoking is never allowed in the theatre. Food is ONLY permitted in the dressing rooms. The stage availability is scheduled through the Purchaser or designated representative. When the crew is on meal break the stage is NOT available. Please do not enter the stage when it is dark. As soon as the crew returns the stage will be made available. If there are any questions regarding the stage availability please consult your stage manager, director, group representative or the Bovard Production Office. Parking is not permitted in the loading dock area or in front of the loading dock doors. It is designated for immediate loading and unloading only. If you are unloading items from your vehicle please do so and then move the vehicle to one of the nearby parking lots. For security purposes, enter and exit through the STAGE DOOR ONLY. If you expect to meet friends or relatives after a performance, direct them to the stage door only. Exceptions may be made on a case by case basis. Please consult the production staff. DO NOT climb onto or jump off of the stage apron. Use the ramps leading on and off the stage. Please avoid touching or holding onto the stage and acoustic drapes. Please do not place objects on pianos, covered or uncovered. Please do not remove chairs from dressing rooms. We will supply any extra chairs you may need, within reason. Please do not use ANY adhesive labels on dressing room doors and mirrors. Any damages incurred by the violation of this guideline will be taken from your cleaning and damage deposit. Alcoholic beverages are not permitted in the auditorium. Alcoholic beverages are permitted under limited conditions in the walkway and portico, and permissions must be obtained in writing from the Bovard Production Office fifteen (15) business days prior to your event. Please contact Trojan Hospitality at 213-740-6285 to obtain an alcohol permit. Once completed, please submit permit to the Bovard Production Office. Student Organizations must also receive approval from the Office of Campus Activities. Check all your valuables with your group representative. The Bovard Production Office will not be responsible for property left in the dressing room. Animals (other than seeing eye dogs) will not be allowed in the facility for any reason other than permitted use in the show and only during rehearsal and/or performance. This privilege must be secured through the Production Manager prior to load in and cannot be altered under any circumstance. Decoration or signs shall not be placed in any rooms, hallways, lobbies, or theatres in the building without the permission of the management. No duct tape or masking tape can be used at ANY time in the auditorium. Any damages incurred by the violation of this guideline will be taken from your cleaning and damage deposit. Balloons are not permitted inside Bovard Auditorium. The house opens 30 minutes prior to scheduled show time. All set-up and sound checks must be completed by this time. The Bovard Stage and House Managers will assist the visiting company in opening the house on time. Under no circumstances will the performances begin or the intermission end without the express direct verbal approval of from Bovard’s Stage and House Managers. 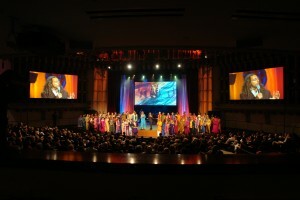 The Bovard Stage Manager reserves the right to control final sound level for any show at Bovard. Any use of pyrotechnics, open flame, and/or smoke or fog will require the services of a Fire Marshal on site. It must be scheduled through the Bovard Production Manager. Only Bovard staff are allowed to operate our equipment, such as our audio or lighting console etc. unless authorized in advance by the Bovard Production Office. Any use and/or changing of rigging and equipment must be approved in advance with Bovard’s Technical Supervisor. The visiting company shall not allow nails, tacks, stage screws, or similar articles to be driven or placed in any part of the premises without the approval of Bovard’s Technical Supervisor. All tape used on the stage must be removed at the end of your event.